Today we are joined by Kroka Expeditions in Marlow, New Hampshire - with an Evergreen Tea recipe. There are many reasons to make a steaming cup of evergreen tea. The warmth alone can be the reason on a rainy day to give comfort to cold fingers and chilly bodies. The taste, especially with honey and spruce needles, is like drinking a delicious, sweet Christmas tree. As the pioneers taught us, the vitamin c is great for health and a good way to ward off scurvy! 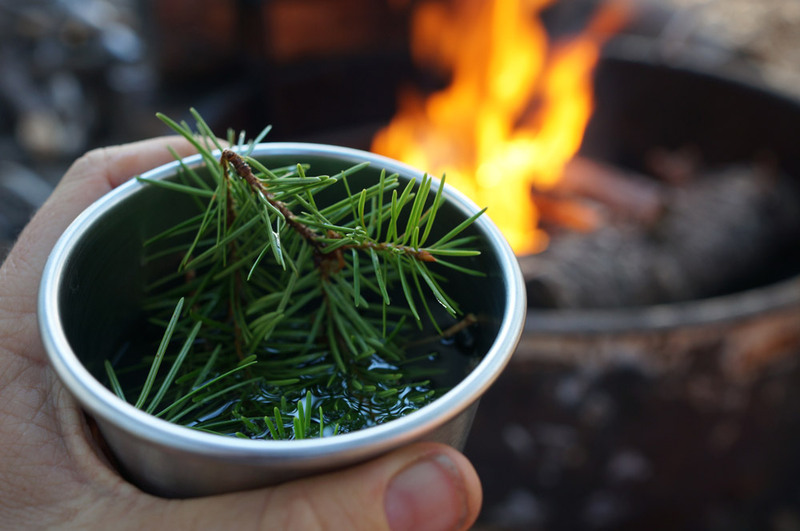 My personal favorite is spiky spruce tea but you can use pine or fir needles as well. Making this tea is really simple even little ones can help make it. Find the bushy branched, spiky needles of a spruce tree that can be easily reached by the harvester. The tree will likely be 10-30 years old. Tear the green tips from each sprig and collect into a birch bark basket or other carrying tool. Boil 3-4 cups of water in a pot on an open fire (or on your kitchen stove). When the water is boiling remove from the heat and add all collected sprigs. Steep for 10 minutes off the fire in a pot or in your cup until it reaches your desired taste. Add some honey for an extra soothing taste and serve after tea has cooled enough for drinking. This drink has a pleasant pine/lemony taste. Images for this post were provided by KC Pagano. Kroka Expeditions is a wilderness school in Marlow, NH committed to awakening in young people a connection to nature and the spirit within, and a capacity for conscious living and compassionate service. We strive to achieve this through wilderness adventure, community living, farming, and the practice of traditional and indigenous skills in Waldorf-inspired semester, summer, and school programs for ages 9-18. Every Thursday Martin goes to the Goose-eye Wilderness School, while Sylvia and her friend Sophia create a Nature Home-school. From wild craft cooking to outdoor games to building projects to tree identification, Nature School will be a year of unfolding learning and fun.